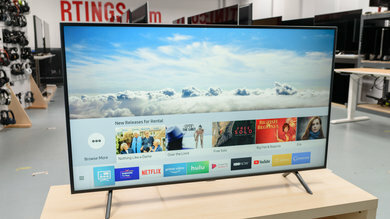 5.1 audio passthrough allows you to connect a source device to a TV and have the TV pass the source’s surround sound signal through to a receiver or soundbar. It can help cut down on the number of cables necessary for a surround sound setup, and without much impact on sound quality. 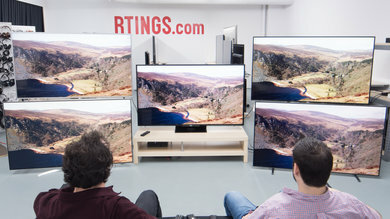 We test whether every TV is able to receive and pass through a 5.1 signal over HDMI ARC and digital optical, for both the DTS 5.1 and Dolby Digital 5.1 audio formats. 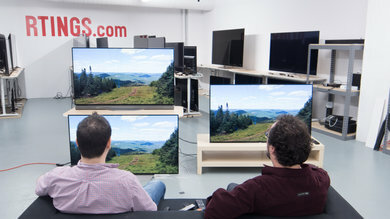 We also test passthrough over HDMI eARC of the Dolby Atmos and DTS:X object-based formats. 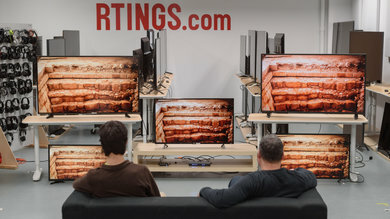 Update 02/28/2019: Added tests for 'eARC Support', 'Dolby Atmos via TrueHD via eARC' and 'DTS:X via DTS-HD MA via eARC', as part of Test Bench 1.3. A 5.1 speaker system with an HDMI ARC or digital optical input. At least one source device capable of outputting a 5.1 audio signal. 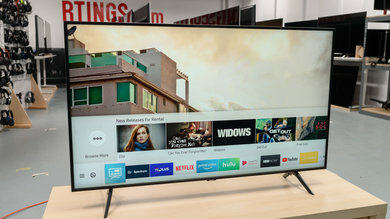 Note that some TVs can only pass 5.1 through over a certain connection (either digital optical or HDMI ARC), and some can only pass through certain signal types (DTS or Dolby Digital), so make sure you pick a TV that supports both the connection and signal type you wish to use. If you use the TV’s speakers, or just use a 2.0 (two speakers) or 2.1 (two speakers + one subwoofer) sound system, you don’t need to worry about 5.1 passthrough. And keep in mind that 5.1 passthrough isn’t a necessity. 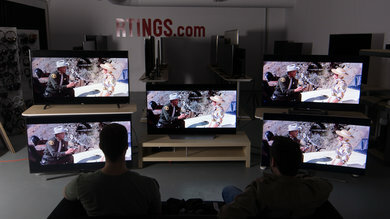 This image is an example of a 5.1 surround sound setup with a TV that doesn’t support passthrough. In short, 5.1 passthrough is just an option that allows you to get surround sound for multiple source devices, with few cables. Here are a couple of examples of home entertainment setups that take advantage of a TV's 5.1 audio output and passthrough. 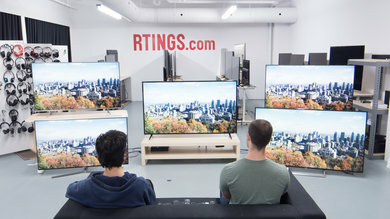 DTS 5.1 passthrough via digital optical capability means a TV can accept a DTS 5.1 signal from a source device, and then pass that along to the receiver over a digital optical cable. DTS is pretty much only found on DVDs and Blu-rays, so it’s only useful for those media. This is only really an important test if you want to do this exact connection and transfer in your setup. 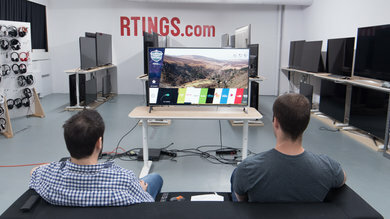 To test for DTS passthrough via optical, we connect a Blu-ray player to our TV via HDMI and play the 5.1 audio test found on the Spears & Munsil HD Benchmark and Calibration Disc (2nd Edition), outputted via DTS 5.1. 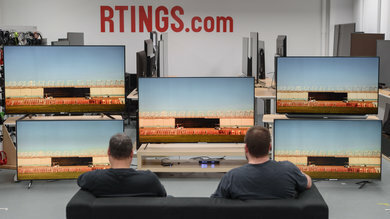 We then output the TV’s audio to our 5.1 receiver via digital optical and see whether the receiver receives a 5.1 signal, or if it is downgraded to 2.1. 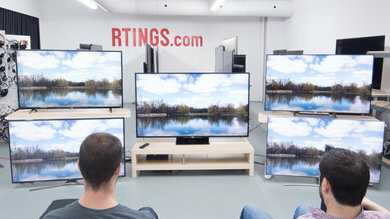 DTS 5.1 passthrough via HDMI ARC capability means a TV can accept a DTS 5.1 signal from a source device, and then pass that along to the receiver via an HDMI ARC connection. This is only really an important test if you want to do this exact connection and transfer in your setup. 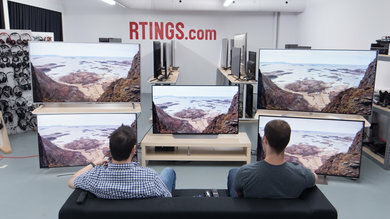 To test for DTS 5.1 passthrough via HDMI ARC, we connect a Blu-ray player to our TV via HDMI and play the 5.1 audio test found on the Spears & Munsil Calibration Disc, outputted via DTS 5.1. 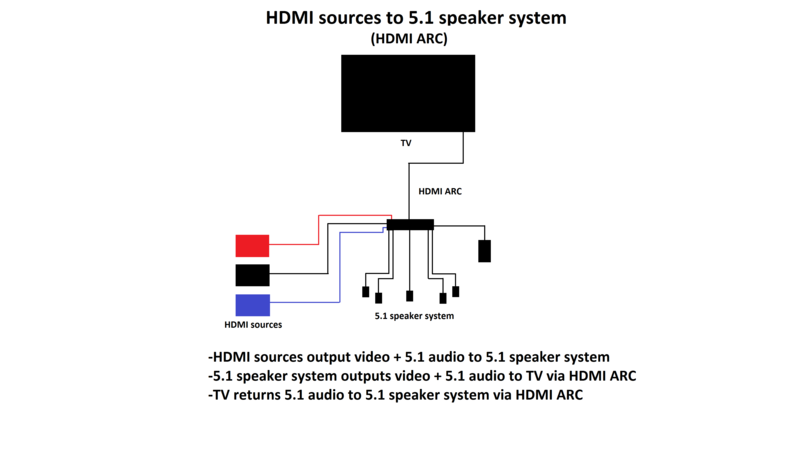 We then output the TV’s audio to our 5.1 receiver via HDMI ARC and see whether the receiver receives a 5.1 signal, or if it is downgraded to 2.1. Dolby Digital 5.1 passthrough via digital optical capability means a TV can accept a Dolby Digital 5.1 signal from a source device, and then pass that along to the receiver over a digital optical cable. Dolby Digital is found on DVDs, Blu-rays, most streaming media, and even some TV channels, so it’s useful for a variety of sources. This is only really an important test if you want to do this exact connection and transfer in your setup. 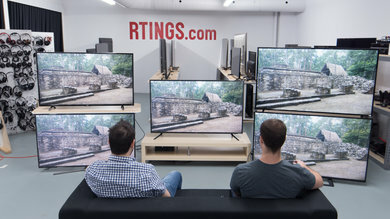 To test for Dolby Digital 5.1 passthrough via digital optical, we connect a Blu-ray player to our TV via HDMI and play the 5.1 audio test found on the Spears & Munsil Calibration Disc, outputted via Dolby Digital 5.1. 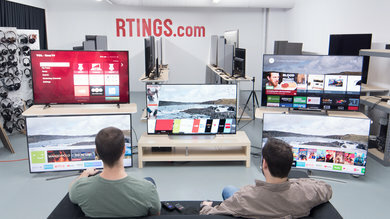 We then output the TV’s audio to our 5.1 receiver via digital optical and see whether the receiver receives a 5.1 signal, or if it is downgraded to 2.1. 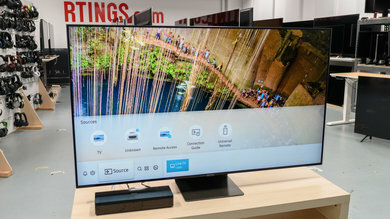 Dolby Digital 5.1 passthrough via HDMI ARC capability means a TV can accept a Dolby Digital 5.1 signal from a source device, and then pass that along to the receiver over an HDMI ARC connection. This is only really an important test if you want to do this exact connection and transfer in your setup. 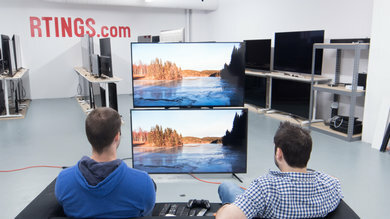 To test for Dolby Digital 5.1 passthrough via HDMI ARC, we connect a Blu-ray player to our TV via HDMI and play the 5.1 audio test found on the Spears & Munsil Calibration Disc, outputted via Dolby Digital 5.1. 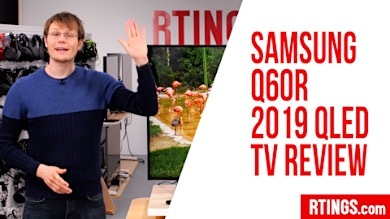 We then output the TV’s audio to our 5.1 receiver via HDMI ARC and see whether the receiver receives a 5.1 signal, or if it is downgraded to 2.1. 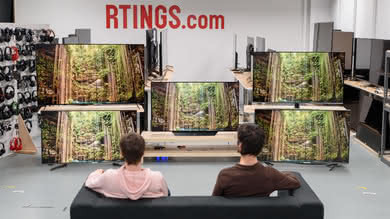 Dolby Atmos via Dolby TrueHD passthrough via HDMI eARC capability means a TV can accept a Dolby Atmos signal from a source device, when Dolby TrueHD is used as the carrier signal, and then pass that along to the receiver over an HDMI eARC (Enhanced ARC) connection. 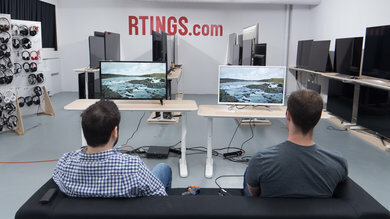 This is only really an important test if you want to do this exact connection and transfer in your setup. 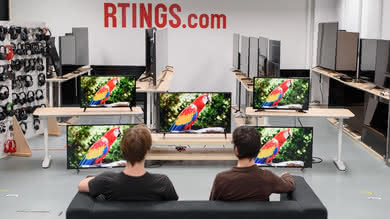 To test for Dolby Atmos via TrueHD passthrough via eARC, we connect a PC to the TV via HDMI and play a Dolby Atmos via TrueHD test file (mkv video) using the MPC-HC media player software, set to bitstream audio. 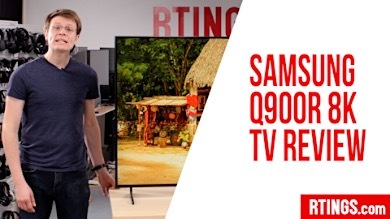 We then output the TV’s audio to our 5.1.2 receiver via HDMI eARC and see whether the receiver receives a Dolby Atmos via TrueHD signal, or if it is downgraded to normal Dolby Digital. 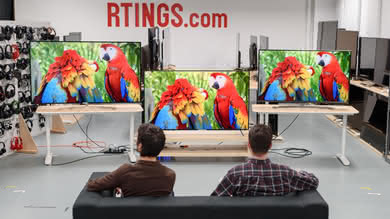 DTS:X via DTS-HD MA passthrough via HDMI eARC capability means a TV can accept a DTS:X signal from a source device, when DTS-HD MA is used as the carrier signal, and then pass that along to the receiver over an HDMI eARC (Enhanced ARC) connection. 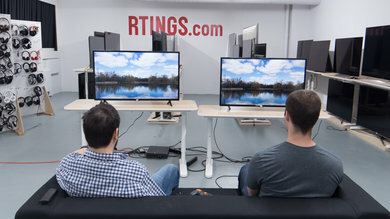 This is only really an important test if you want to do this exact connection and transfer in your setup. To test for DTS:X via MA passthrough via eARC, we connect a PC to the TV via HDMI and play a DTS:X via MA test file (mkv video) using the MPC-HC media player software, set to bitstream audio. 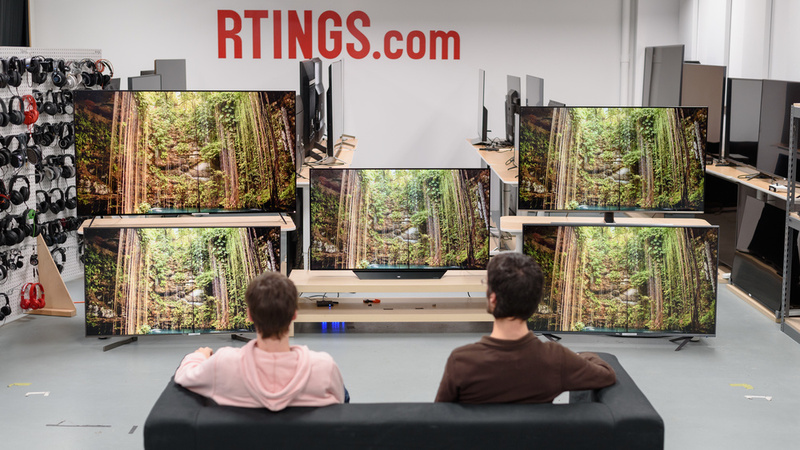 We then output the TV’s audio to our 5.1.2 receiver via HDMI eARC and see whether the receiver receives a DTS:X via DTS-HD MA signal, or if it is downgraded to normal DTS. 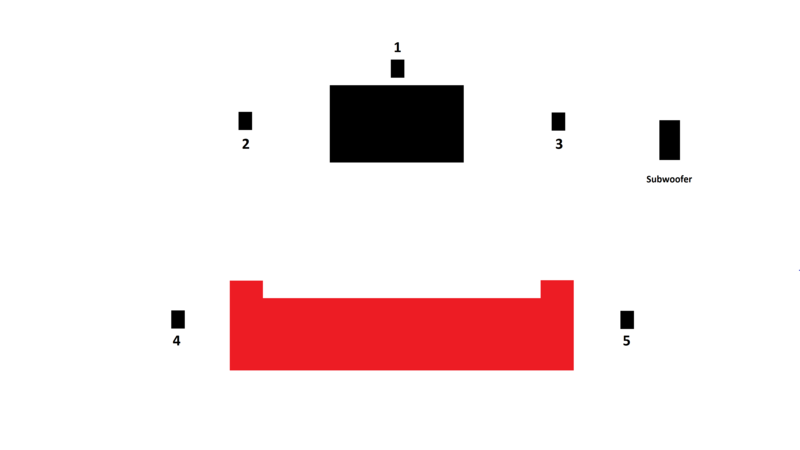 ‘5.1’ is the typical surround sound setup, and involves five (5) ‘regular’ speakers, and one subwoofer (which is the ‘.1’ in '5.1'). The speakers are ideally positioned as follows. 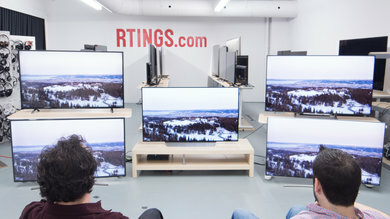 In front: One speaker to the left of the TV, one in the center (either just above or just below the screen), one to the right. For the most part, these handle dialogue and the sound of onscreen action. To the sides: One speaker each to the left and right of the seating area. These are mostly for playing sound from action occurring to the side and rear of the camera’s point of view. Subwoofer: Should be placed on the floor to the side of the TV. Plays deep bass. 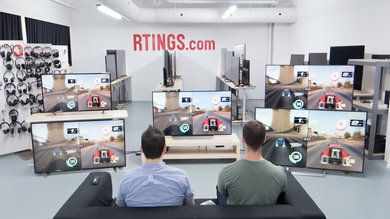 All six speakers receive and play their own unique audio channel, and having five speakers in different places, each playing different sounds, adds a sense of space and direction to the audio that you would not get with stereo setup (2.0). You also benefit from having a dedicated subwoofer, as that provides deeper bass than you would get from regular speakers. 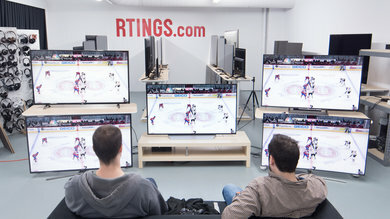 In a typical setup, multiple source devices will be connected to the TV via HDMI, a cable which can transmit both video and audio. 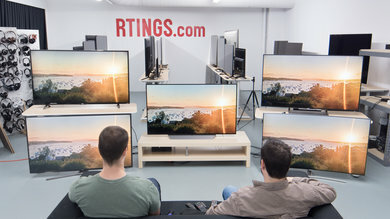 With 5.1 passthrough, instead of needing to connect a separate wire from each source to the AV receiver in order for the audio signal to make it to the receiver, a single audio connection is established between the TV and the receiver. 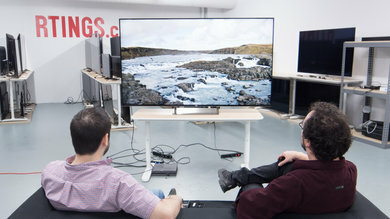 The 5.1 audio signal is transmitted via the existing HDMI connection from the sources and into the TV and then sent by the TV down the audio output and to the receiver. Depending on the number of sources you have, and whether they all support the 5.1 signal types you want to use, this kind of setup can eliminate several extra cables, and without noticeable impact on sound quality. There are several different kinds of audio encoding used to deliver surround sound in a video. The three most common are Bitstream formats called Dolby Digital and DTS, which are both compressed, and then PCM, which is uncompressed. Bitstream audio is compressed, meaning information that is deemed less important to the sound is removed from the signal. This does reduce the quality somewhat, but it’s important to note that compressed audio still sounds very good – good enough that the average person is not going to hear much difference between it and uncompressed audio. With Bitstream, the audio signal (basically instructions telling the speakers what to do) is encoded (packaged) by the source device, and then sent to be decoded (unpacked) by the receiver, with the resulting information then telling the speakers what they are meant to play. This delivery method makes for a smaller signal size, and so it is easier to send multiple channels of audio. It also means that a receiver needs to have the ability to decode a particular Bitstream audio format in order to play it. Without that ability to decode the signal, a receiver will not be able to unpack and play a given Bitstream audio signal. At present, you must use a Bitstream signal if you wish to pass 5.1 audio through a TV. You can do this both via HDMI ARC and digital optical. There are two main kinds of Bitstream signals. There is Dolby Digital 5.1, which is a very common audio format, found on DVDs, Blu-rays, and most streaming media, and is a bit more heavily compressed. The other is DTS, which is also a common audio format and is also found on most DVDs and Blu-rays. It is very uncommon with streaming media, though. It isn’t quite as compressed as Dolby Digital. You need to use either DTS or Dolby digital in order to pass a 5.1 signal through a TV. 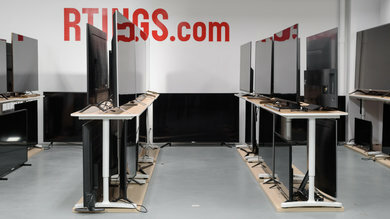 While DTS is somewhat preferable in terms of audio quality, Dolby Digital is more widely available. 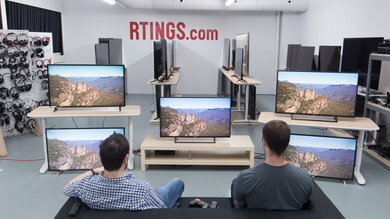 Use DTS in your setup if you only watch Blu-rays or DVDs. Pick Dolby Digital if you also watch streaming videos. Output audio directly from each source device and to the receiver. Output this audio via HDMI, and not optical. PCM is an uncompressed audio format, which means it will theoretically have the best overall sound quality, as no information has been removed to facilitate transmitting the signal. PCM is sent unencoded by the source, meaning the full, unpacked ‘instructions’ for what sounds to play are sent directly from the source to receiver, and then on to the speakers. Unfortunately, this makes for a signal that is more difficult to transmit. No TV seems to be able to pass a 5.1 PCM signal through to a sound system, so sending a PCM signal to or from a TV will downgrade the signal to 2.1 (two speakers + one subwoofer), thus eliminating the extra channels necessary for surround sound. PCM 5.1 can work with a receiver that supports the format, so if you want uncompressed sound, you’ll need to forego passing the audio through your TV, and instead output the sound directly from the source (one that outputs PCM 5.1) to the receiver. Note that only HDMI can transmit a 5.1 PCM signal. Digital optical is only capable of transmitting a 2.1 or 2.0 PCM signal. Output audio directly from each source device and to the receiver. Output this audio via HDMI, and not optical. 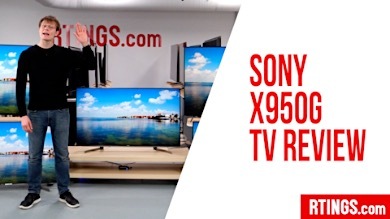 Here are the steps you need to complete to enable 5.1 passthrough on compatible TVs. 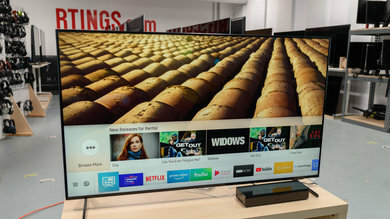 CEC: To enable HDMI ARC, you typically also need to enable a feature called ‘CEC.’ This makes it so that some commands sent to the TV, receiver, or source device can result in instructions being relayed to one of the other devices. 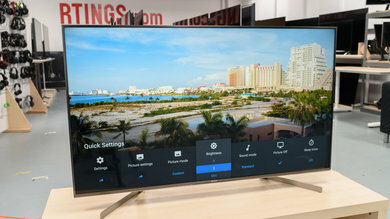 For example, with CEC, powering the TV on might also power on the receiver, or pressing the volume up/down buttons on the remote will adjust the receiver’s volume output. 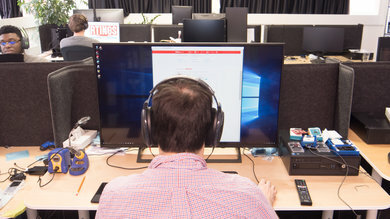 Just be aware that this sort of thing may start happening with your setup. 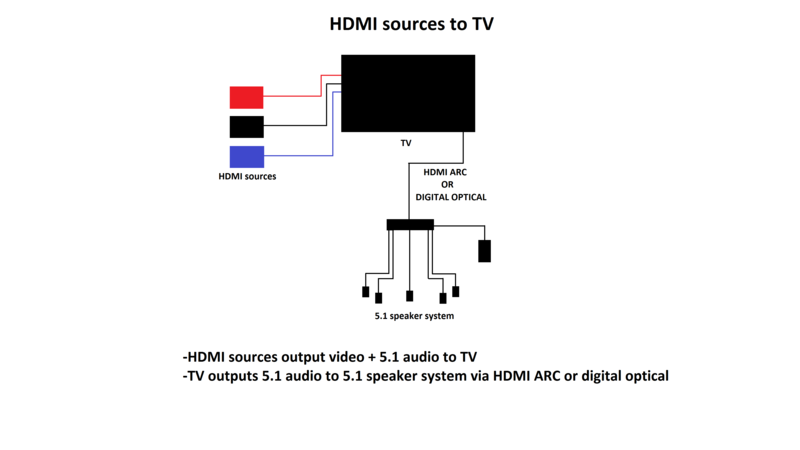 For HDMI ARC: Make sure the TV and the receiver/soundbar are both connected by their respective HDMI ARC ports. For Digital Optical: Make sure the cable is firmly connected to each device. It should make a clicking noise when it gets plugged in. 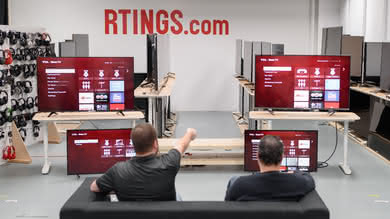 5.1 surround sound passthrough allows a TV to accept a 5.1 signal and then pass it along to a speaker system. It’s not the most important feature, but in some situations, it can help cut down on the number of cables required for a surround sound setup. 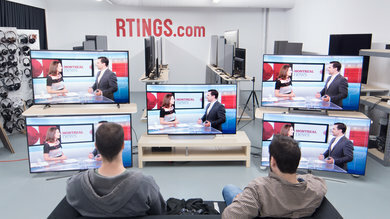 We test whether each TV is able to receive and pass both Dolby Digital 5.1 and DTS 5.1 signals to a 5.1 receiver. 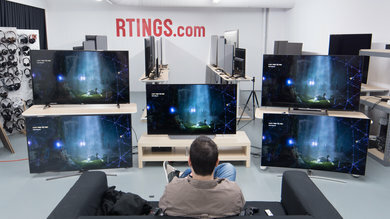 We also test passthrough over HDMI eARC of the Dolby Atmos and DTS:X object-based formats. 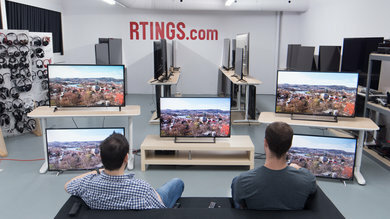 Different TVs require different settings in order to enable 5.1 audio, and the requirements differ slightly for HDMI ARC and digital optical. 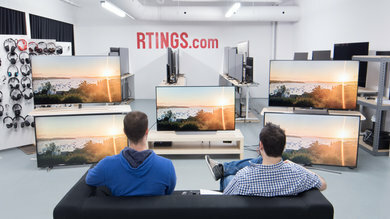 If you want 5.1 passthrough, be sure to get a TV that supports the feature for the signal type you use, and then make sure your TV’s settings are such that they will allow the process to happen. Above, we list some of the steps required for the more common brands.